Durable and lightweight, it represents a sound investment for a beginner. You will get three bolts, a quiver, a scope, a rope cocker, and a shoulder sling, so you won’t have to spend money on extras. The safety mechanisms employed make it a good option for anyone who wants to avoid ill shots. The adjustable stock seems to be noisy and clunky, which might make your prey run away. The accessories appear to be from cheap materials. The Sniper deserves its name as it helps you take aim and shoot with tremendous accuracy while making the bolts fly at superior speeds toward the target of your choosing. It comes in a compact size that allows you to move it around with ease, and it is optimal for your trips to the great outdoors in search of big game. As it comes along with a broad range of accessories, you may find it’s just what you need, without having to purchase extras separately. 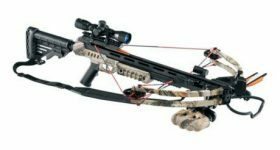 That makes the CenterPoint Sniper 370 a good deal, too, and if you are looking for a high-performance crossbow at a decent price, this is right on the money. The build of a crossbow plays a vital role in ensuring precision for each shot. That is why we will first look at how the Sniper is constructed. The CNC-machined cam system is responsible for sending the shooter’s bolts flying at maximum speeds of 370 feet per second. That is not something to take lightly, and also the reason why this crossbow qualifies for big game hunting. Made from lightweight, yet durable materials, this model is easy to carry around, an aspect important for many hunters who need to haul around a lot of equipment. Its total weight is 7.9 pounds, and, for a crossbow, this is considered a good option. The composite limbs maintain the total weight to a minimum, and even magazines specialized in hunting equipment recommend this model for having a CNC-machined rail, without demanding a premium price. The riser is made from aluminum while the stock is a combination of composite and aluminum. 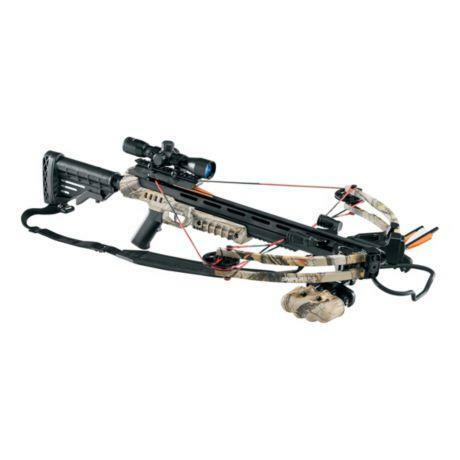 All these aspects contribute to the overall compact and durable build of this crossbow. Packing a lot of power for its compact size, the CenterPoint Sniper 370 is an excellent choice for someone who seeks his or her first crossbow. From the CNC-machined cam system that can propel bolts at speeds of 370 feet per second, to its overall lightweight design, this model is sure to make an impression. The 185-pound draw weight is impressive, too, and the fact that even beginners can use it is an excellent plus. The stock is fully adjustable, which means that you will be able to adapt it to any shooting style, while the pass-through foregrip is an excellent add-on, too. The quad limbs complete the picture of a well-made crossbow that will not let you down. Precise and deadly, this crossbow is elegant and makes a great first impression from the first look. Available in black and camo pattern, the model is a must-have for beginners who want to go after big game. The 18-inch axle to axle width makes it more maneuverable than most crossbows available. Besides the adjustable stock and the pass-through foregrip, the model features other exciting traits that will surely convince you that this is the crossbow for you. The 4x32mm scope offers a sure way to take perfect aim at your target while the cam system takes care of sending your bolts with deadly accuracy towards it. The CNC-machined rail is not a feature you should typically see on various models available, especially in this price range, but this one has it. Many buyers are satisfied with the number of extras provided with this crossbow. The manufacturer also supplies three 20” bolts made of carbon, a quiver to hold them, a rope cocker to reduce strain, and a shoulder sling for easy transportation. Other things that must be mentioned are the two safety mechanisms employed, one anti-dry fire, and one auto-safety trigger feature. They eliminate the risk of ill-shots and accidents. This is one aspect that any hunter wants to know about when selecting a crossbow. This model comes with noise suppressing stops, which means that it is quiet, as it is deadly. The stops eliminate vibrations so that you don’t make unnecessary noise when cocking your weapon and taking your aim. The entire construction of the crossbow contributes to reducing noise, which is a great plus. When you’re shopping for a new crossbow, always take a close look at the noise dampening features available. In this case, the Sniper does what is needed, and eliminates noise and vibrations by using these suppressors that control the string. Performance is the key to good value for a crossbow, and this model delivers. Using high-quality materials for all the components, such as composite and aluminum, this model is durable, and, at the same time, remains lightweight. Carrying it around is a breeze, due to the shoulder sling provided, but also its decent weight. Highly accurate and capable of throwing bolts at speeds of up to 370 feet per second, it is the weapon you should want by your side when you go big game hunting. A plethora of accessories is included, to make this an excellent deal.